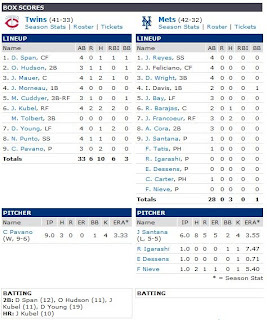 Last night, former Blue Jay Roy Halladay, now with the Philadelphia Phillies, threw seven shut out innings in a 9-0 Phillies win in Halladay's first game against his former team. 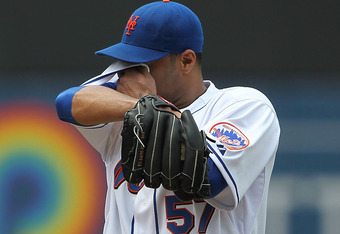 Johan Santana hoped to have similar success against his former Minnesota Twins teammates as he faced them for the first time since being traded in 2007. But after Orlando Hudson, Jason Kubel and Delmon Young all had doubles in the first inning, Santana found himself in a 4-0 hole after throwing 40 pitches in the first inning alone. Santana did settle down after that, lasting six innings, giving up five runs on eight hits, walking two and striking out only four. Twins DH Jason Kubel hit a solo homer in the top of the ninth, and the final score was 6-0. Twins starting pitcher Carl Pavano stole the show, however. Super Pavario pitched his second straight complete game shutout, and is now 4-0 with a 1.63 ERA and helping the Twins end their four-game slide. Santana, who won the 2004 and 2006 (and should have won the 2005) AL Cy Young Awards while posting a 94-44 record with a 3.22 ERA and over 1300 strikeouts during his eight seasons with the Twins. The Twins are the only MLB team that Santana hasn't beat during his eleven year career.